Home→Activities→How can you help the Home for the Retired Horses ? 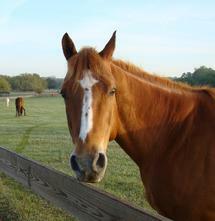 How can you help the Home for the Retired Horses ? The 5th Annual Spring Sale to benefit the Retirement Home for Horses will be held on SATURDAY APRIL 6TH from 9AM-3PM. They are currently accepting donations for the sale at the Mill Creek Farm. Visit www.millcreekfarm.org for more information about making a donation or attending the sale. This is a non-profit organization that provides a safe haven for abused, neglected, and retired service horses. Mill Creek Farm is a great place to take your children to visit !